30/09/2016 – Farewell Professor Apostolos Papanikolaou: Mini-Symposium on Ship Design (presentation on “A Farewell to the Design Spiral” by Prof. Horst Nowacki), Ship Hydrodynamics (presentation on “Added Resistance, Unsteady Wave Field and Memories” by Prof. Shigeru Naito) & Maritime Safety (presentation on “How digitalisation will drive ship safety” by Dr Pierre Sames). Venue: Royal Olympic Hotel, Athens. The Farewell and Mini-Symposium was attended by many guests, both from Greece and the International Maritime Community (see photos by Efoplistis magazine issued in Nov 2016). The staff of the Ship Design Laboratory of NTUA expresses its sincerest gratitude to our Professor and wishes him all the best for the new period of his life! 7/06/2016 - – Victor Bolbot was granted the DNV-GL award in the category “Greener” for his diploma thesis on "Optimization of Ship’s Bow for Added Resistance in Waves", supervised by Prof. A. Papanikolaou. The staff of the Ship Design Laboratory of NTUA congratulates Bolbot for this well-deserved award and wishes him every success in his professional career! on the “Added Resistance of Ships in Waves: Theoretical and Practical approaches”. 03/11/2014 - The first edition of Prof. Papanikolaou ’s text book on “Ship Design: Methodologies of Preliminary Design” by the renowned publisher SPRINGER (ISBN 978-94-017-8751-2) was festively celebrated by his colleagues and NTUA-SDL staff! 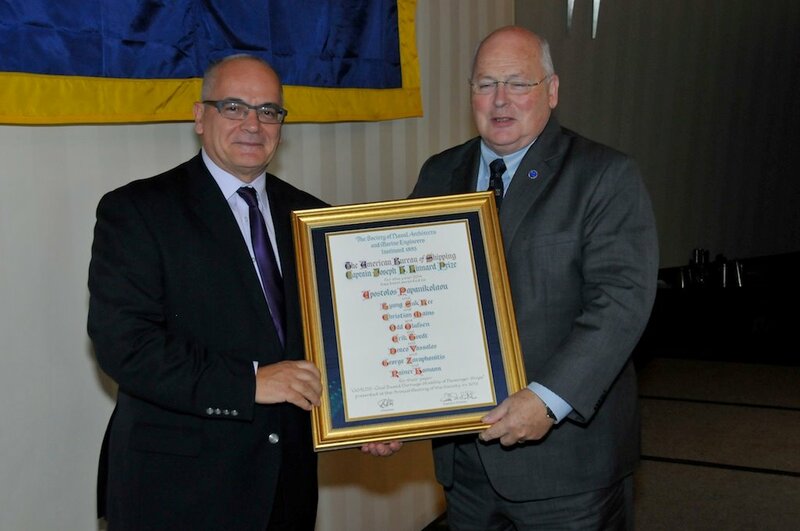 27/10/2014 - Prof. Apostolos Papanikolaou was invited for the festive 74-year anniversary speech in the official NTUA ceremony hall on Monday 27th October 2014. 23/10/2014 - Prof. A. Papanikolaou et. al.' 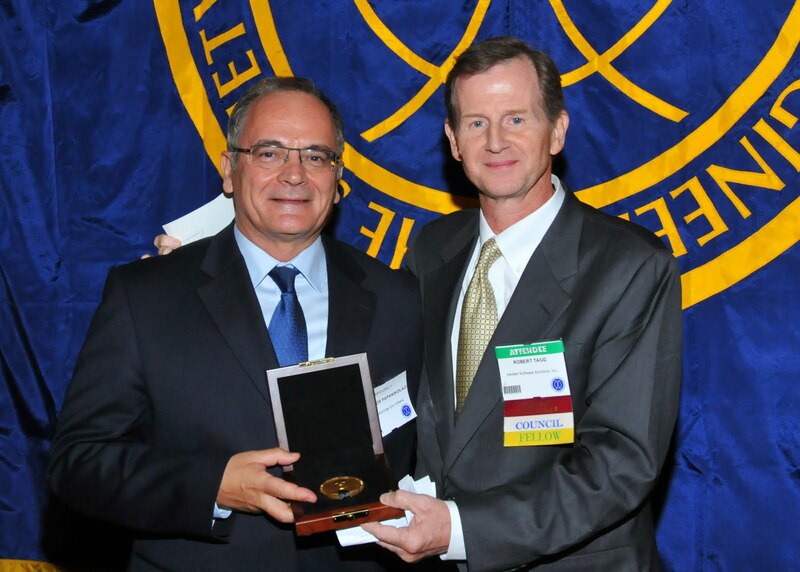 s paper on “GOALDS – Goal Based Damage Stability of Passenger Ships” was awarded the 2014 American Bureau of Shipping-Captain Joseph H. Linnard Prize at the SNAME Annual President’s Luncheon on Thursday, October 23, 2014. For further details, please visit SNAME’s website. 15/09/2014 - The first edition of Prof. Papanikolaou ’s text book on “Ship Design: Methodologies of Preliminary Design” has been released by the renowned publisher SPRINGER (ISBN 978-94-017-8751-2). It is available both as e-book and in print. The book is an enhanced version of the lecture notes of Prof. Papanikolaou at NTUA, published originally in Greek by SYMEON publishers. 27/08/2014 - Prof. A. Papanikolaou et. al.' s paper on “GOALDS – Goal Based Damage Stability of Passenger Ships” will be awarded the 2014 American Bureau of Shipping-Captain Joseph H. Linnard Prize at the SNAME Annual President’s Luncheon on Thursday, October 24, 2014, at 12:30pm, in the Imperial Room of the Hyatt Regency Houston, Texas. For further details, please visit SNAME’s website. All NTUA-SDL staff feels once again exceptionally honored for this prestigious award and expresses hearty congratulations and gratitude to our Professor for his dedication to Ship Design Research! 27/06/2014 – A Friendship Systems software training course for the Ship Design Laboratory staff and students was successfully held from June 25 to June 27, 2014 (see photos). Due to a strike of the administrative personnel of NTUA, the course was hosted at the Cultural Centre of Athens Municipality, offered to NTUA-SDL free of charge (during the course, outside under shadow temperatures were 40+ deg Celsius, but the room was air-conditioned). We thank Friendship Systems, the instructor Matthias Maasch and the Cultural Centre of Athens Municipality for their valuable services to NTUA-SDL, especially in view of the uneasiness at our university campus in the last two weeks. 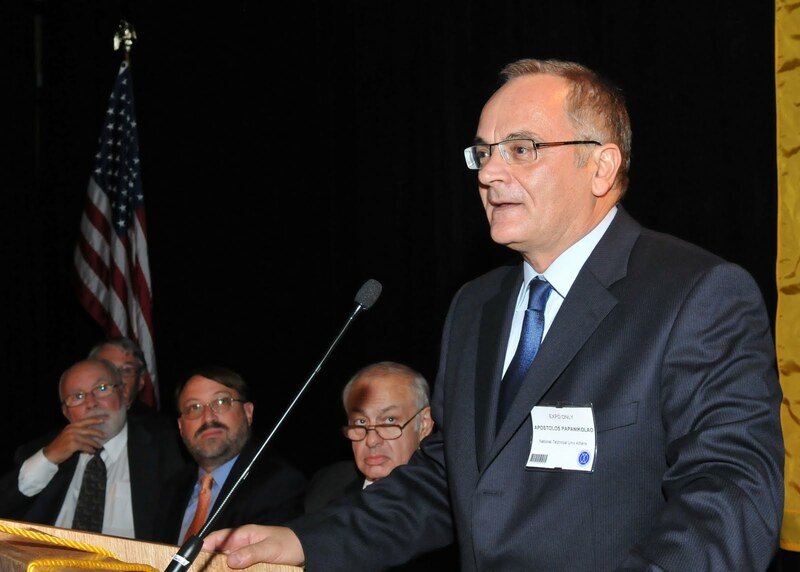 16/04/2014 – Prof. A. Papanikolaou, Director of NTUA-SDL, is the winner of the EU Champions of the Transport Research 2014 competition in the Waterborne category! The awards ceremony took place during the EU R&D TRA 2014 Conference in Paris, at 17.30pm on 16th April 2014 (see photos). All NTUA-SDL staff feels much honored for this award and likes to wish Prof. A. Papanikolaou all the best for many more years to come! 23/01/2014 – Michalis Pytharoulis was ranked first in the annual SNAME-Greek section Diploma Thesis Competition with his diploma thesis on "Parametric Modeling of Cargo and Ballast Tanks and of Corresponding Piping Systems Using AUTODESK INVENTOR" , supervised by Prof. A. Papanikolaou. The staff of the Ship Design Laboratory of NTUA congratulates Michalis for this well-deserved award and wishes him every success in his professional career! 05/06/2013 – Lambros Nikolopoulos received for his diploma thesis on "A Holistic Methodology for the Optimization of Tanker Design and Operation and its Applications" , supervised by Prof. A. Papanikolaou, the First Prize of the GL AWARDS FOR YOUNG PROFESSIONALS 2012. The award ceremony was held during the Nor-Shipping Maritime Exhibition in Oslo. All staff of the Ship Design Laboratory of NTUA congratulates Lambros for this well-deserved award and wishes him good steaming ahead in his professional career! 09/03/2013 -- EXCELLENCE AWARD 2012 on the HOLISTIC METHODS ON SHIP DESIGN AND SAFETY is presented on the Educational Zone of TV Channel ET-1, on Saturday 9th March at 11:45 a.m.
Prof. Apostolos Papanikolaou visited Osaka Prefecture University in Japan in the period 19th January to 17th February 2013 on the Special Guest Professor Program of OPU, aiming to stimulate OPU students' intellectual growth, to provide access to the finest in the world-class research, and to build tighter relations between OPU and leading universities around the world; in this framework, OPU and NTUA signed a collaboration agreement. During his visit, Prof. Papanikolaou gave a series of lectures on ship design, ship hydrodynamics and ship stability to students of OPU, Osaka University and the KANSAI Society of Naval Architects and Ocean Engineers of Japan: see also relevant article in KANRIN: Bulletin of The Japan Society of Naval Architects & Ocean Engineers, No.48, May 2013. 17/12/2012 -- The first Excellence Conference was successfully held on December 17th, 2012 (download photographs). *** EXCELLENCE AWARD 2012: The Greek Legend of Naval Architecture & Mαrine Engineering, the director of NTUA-SDL, Prof. Apostolos Papanikolaou and his Research Team were awarded the prize on the HOLISTIC METHODS ON SHIP DESIGN AND SAFETY, click for for further details click the below links (to download the video in English , in Greek , with English subtitles or watch it on-line) . 03/07/2012 -- Papanikolaou, A., Book on "Risk Based Design" now in Chinese! 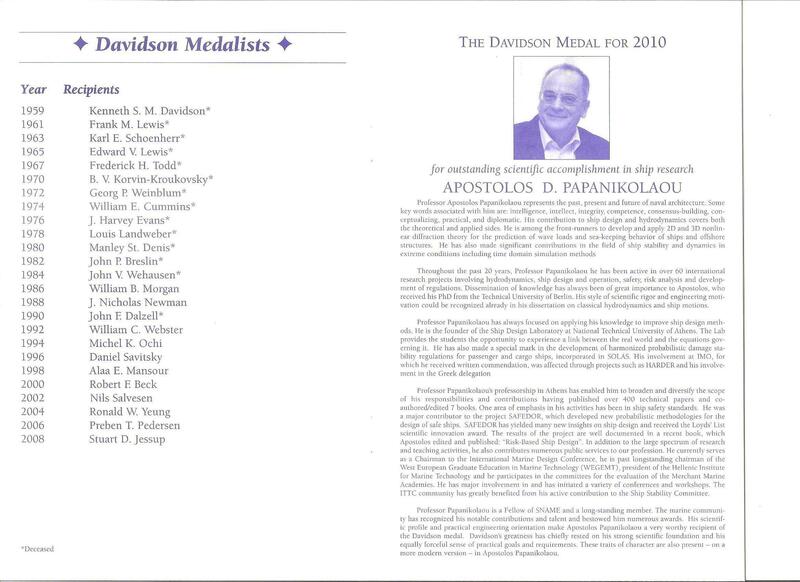 15/02/2012 -- Prof. Apostolos Papanikolaou is candidate for the 2011 STATUS Men Of The Year Awards under "SCIENTISTS". Voting ends in 29 days! 01/02/2012 -- Listen to The Report by Simon Cox, BBC 4, on the Safety of Cruise Ships after the Costa Concordia accident. Includes interview with Prof. A. Papanikolaou. Thursday, 2/2, 22pm. 16/12/2011 --ABS 2011 awards ceremony will take place at the Ship Design Laboratory NTUA and 5 students will be offered a total prize of 5000 euros. George Koutroukis was ranked first, his essay was supervised by Prof. Apostolos Papanikolaou. 18/10/2011 -- Container Ship Concept by G. Koutroukis and A. Pavlou is among the top three winners of the "Visionary Concepts for Ships and Floating Structures" academic competition award of Visions Olympics 2011. The award ceremony will take place at the Transport Research Arena TRA2012 conference on the 23rd of April in Athens (http://www.traconference.eu/). Our 2nd team on L2-07 The G5 Tanker by Nikolopoulos, Pytharoulis, Damianidou et al. was ranked 4th! Both projects were supervised by Prof. Apostolos Papanikolaou. 29/09/2011 -- Dipl.-Eng. 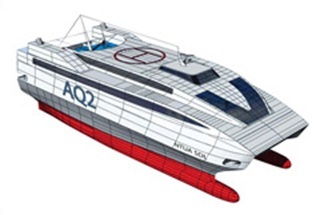 Sotiris Skoupas defends his Doctoral Thesis on "Integrated Methodology for the Design of Ro-Ro Passenger Ships" Rm. I.1, 15:00 Guests welcome! 15/04/2011 -- Dipl.-Eng. Shukui Liu defends his Doctoral Thesis on "Numerical Simulation of Large Amplitude Ship Motions & Application to Ship Design & Safe Operation" Rm. I.1, 15:00 Guests welcome! 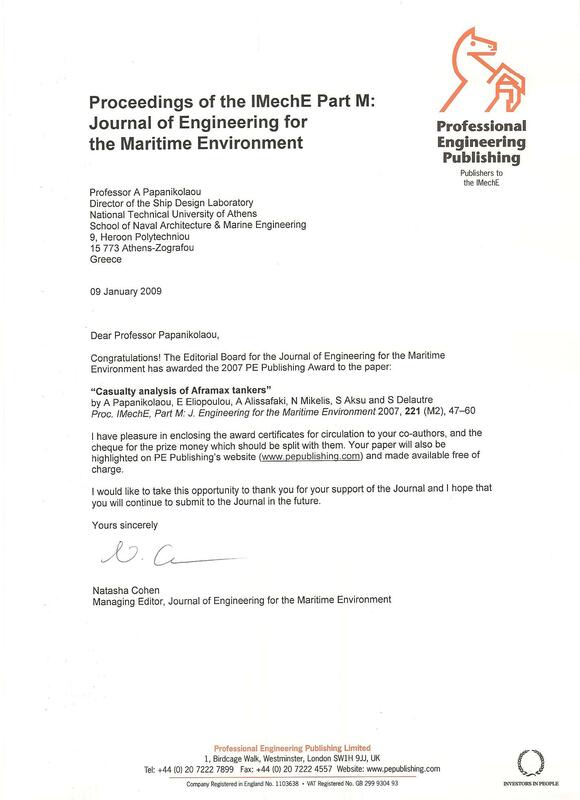 The Editorial Board for the Journal of Engineering for the Maritime Environment has awarded the 2007 PE Publishing Award to the paper: "Casualty analysis of Aframax tankers"
by Papanikolaou, A., Eliopoulou, E., Alissafaki, A., Mikelis, N., Aksu, S., and Delautre, S.
Proc. IMechE, Part M: J. Engineering for the Maritime Environment, 2007, vol. 221(issue M2), pp. 47-65. The paper will also be highlighted on PE publishing website (www.pepublishing.com) and made available free of charge. 08/03/2006 -- Dipl.-Eng. Eleftheria Eliopoulou defends her Doctoral Thesis on "Methodology of Development of New Damage Stability Rules and Impact on Ship Design"
16/12/2003 -- Dipl.-Eng. Evaggelos K. Boulougouris defends his Doctoral Thesis on "Ship Design Optimisation For Enhanced Survivability After Damage For Ro-Ro Passenger and Naval Ships"
20/12/2002 -- Dipl.-Eng. Dimitrios Spanos defends his Doctoral Thesis on "Simulation of flooded ship motion in waves and assessment of Ro-Ro passenger ship behavior", Rm. I.1, 15:00 Guests welcome! "Archimedes' Work Revisited and Rediscovered: On the Physical Foundations of Ship Stability"
The Ship Design Laboratory and the School of Naval Architecture and Marine Engineering of NTUA organized in May 2003 the prestigious 8th International Marine Design Conference. The conference was supported by local and international scientific and professional societies and the national and international shipping and shipbuilding industry. The technical program included the presentation of six key-note lectures by invited international speakers and 90 peer-reviewed technical papers. A post-conference technical program (May 9-13, 2003) had been arranged for workshops of EU funded thematic networks and projects. Thank you for your participation and your contribution to the success of IMDC03 conference. NTUA-SDL is the coordinator of the SAFEDOR training and dissemination activities. Under this section, updates on training and knowledge dissemination events are provided.